According to industry experts Google+ will become an even bigger factor in 2014 and currently it has the second highest number of monthly users after Facebook. Google+ should no longer be thought of as ‘just’ another social network. It’s increasingly proving itself to be an integral part of SEO and social signals, helping provide a more personalized search experience for users. 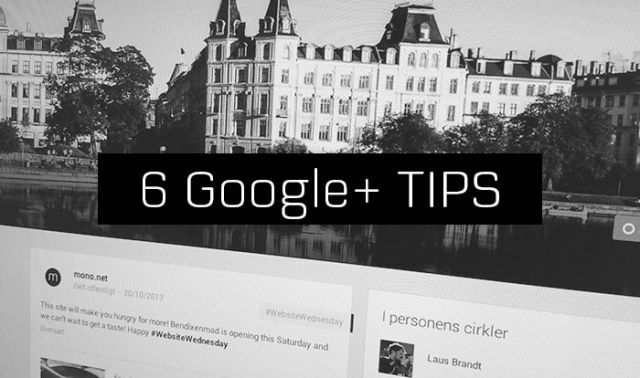 Make it easier for your customers to find your business with these six simple Google+ tips. Your presence and activities on Google+ affect your page rank on Google so you can improve your SEO results if you are effectively using the social network. Add keywords for your business in your Google plus description. You can also add links to different pages of your website. This is important for your search results on Google! Google+ gives you a special visual opportunity to present your brand with a larger cover photo (2120 pixels wide by 1192 pixels high). There are no limitations for you to showcase your products, location or advertise anything around your business. There is a special section for links in the Google+ business page. Use this space to cross-link your account with all your others social media channels on Facebook, Twitter, YouTube, LinkedIn and so on. Let your followers easily connect with you over all social channels and increase your traffic. Create a Google+ Local Page if you are a local business (e.g. if you have a physical shop) to let your physical location be easily found by existing and potential customers. Your local Google+ page connects you with customers on Search, Google Maps and Google+, no matter what device they are using. Read more about Local online marketing here. The +1 vote is not just a “Facebook like”, it is also a social recommendation that Google uses as a signal to improve your ranking in the search results. Add a +1 Button to your website content and let people share your content over Google+ to improve your page rank and search results on Google. Want to get started with Google+ for your local business? Look here. Don’t have a local business? Look here. If you have other great tips for using Google+ or if you want to show us your Google+ profile, please share below. Thanks!